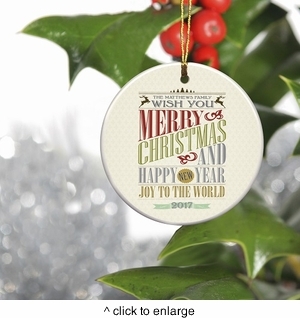 DETAILS: Celebrate the season and remember the magic of Christmas with our personalized family name ceramic ornaments. Choose the design that captures your recipient's holiday spirit. Our Ceramic Family Name Ornaments, comes with metallic ribbon supplied as shown. PERSONALIZATION: 1 Line up to 15 characters, and Year. Words and design are standard.